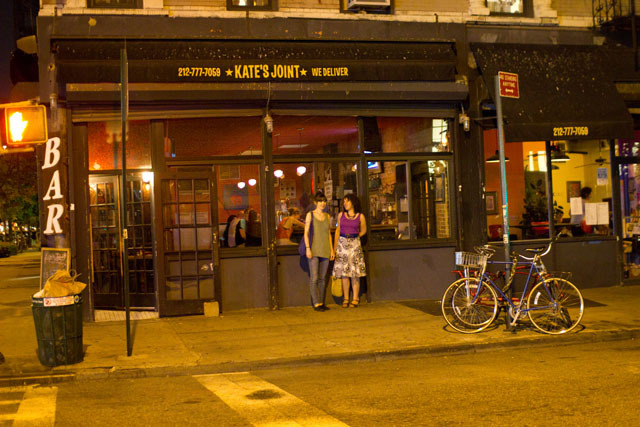 Kate’s Joint, vegetarian restaurant and bar, has been a staple in New York City’s East Village since 1996. Solely owned and operated by neighborhood native Kate Halpern, who dreamt to create an affordable restaurant to serve the community she grew up in. Kate’s Joint has grown to become much more than just a business, it is a home for locals and travelers a like, a place to bring family and friends, and to meet new ones. Unfortunately, with the changing neighborhood and economic recession Kate’s Joint has seen a fall in business and rise in costs. Kate is currently in arrears with the landlord. Eviction notices have been sent, court appearances have been made, and if a substantial amount of money is not raised by April 11th, the next court date, the doors will shut permanently at Kate’s Joint. The East Village will lose another neighborhood landmark. Kate’s opened the same year I moved to Manhattan, but I didn’t have my first meal there until 1997. At the time, I lived on the outer edges of the Upper West Side with Central Park on my right and a Law & Order crime scene on my left. I ventured downtown on occasion but usually to the West Village and rarely did I cross over into Alphabet City where Kate’s resided on the corner of Fourth Street and Avenue B. Alphabet City (Avenues A, B, C, and D) was deemed unsafe by whoever made such determinations, but that didn’t factor much into my avoidance of the area. It was a good 45 minutes away from my apartment — a journey that included two trains and an eastward trek across long avenue blocks. I preferred to wander up Broadway to The West End or Tom’s Restaurant (yeah, the place from this and this), where I mingled with the Ivy League students just a year behind me. Like Gatsby, I could claim to having “gone” there while not exactly being a “Columbia” man. The New York Times, a bottomless cup of coffee, and the view from the front window of Kate's kept me occupied on many Sunday afternoons. This changed when I met my friend Brooke, a pale but colorful woman from Virginia who had no fear of Alphabet City but instead saw the hipness starting to emerge from the track marks. She was always ahead of the curve. She once mentioned her friend Laurel who threw cocktail parties for New York writers and editors. We went to one of the early ones together and she introduced me to a charming woman wearing a feather boa. I think things turned out well for her. Brooke and I were vegetarians (Brooke might still be — I am decidedly not anymore). However, neither of us were health nuts. Unfortunately, most vegetarian restaurants served dishes so bland not even the animals they spared would eat them. Kate’s Joint offered your classic comfort diner fare just without meat. The first time Brooke and I went, I ordered the Un-Turkey Club, which effectively mimicked the flavor kick of turkey and the texture of crispy bacon. We shared an order of Buffalo Un-Chicken Wings The sauce would ignite my taste buds and I’d calm them down with an ice tea. The East Village was still gritty in the late ’90s. Apparently, there were heroin junkies in Kate’s bathroom every day. I never came across any or if I did, I probably mistook them for atmosphere. Beside, the graffiti on the restroom walls was more lucid than you’d expect from someone who was strung out. When Brooke left New York, I continued to frequent Kate’s. I was there at least twice a week, usually more. 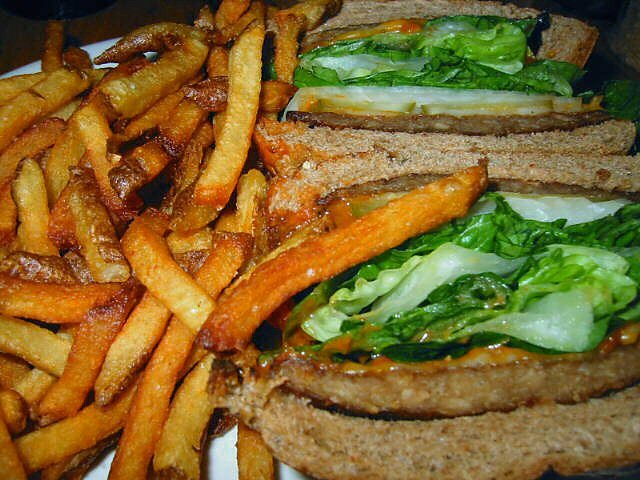 I experimented with other items on the menu (the southern fried cutlet, for instance) but would usually return to the Un-Turkey Club. My friend and coworker Debbie (who I think is still a vegetarian) swore by the Fake Steak au Poivre. Kate’s was sometimes the start of an extended post-work evening for us in the East Village. The streets burst with the promise of exciting places to meet and interesting people to see. I put it that way because you always seemed to know the bars and clubs more intimately than you did any of the regulars. The places would always be the same when you returned but the people never were. That’s perhaps why I remember Kate’s so well — the indie rock soundtrack, the hipster servers and patrons who never aged, the quirky fliers on the wall near the door promoting a concert or just looking for a roommate. It doesn’t take much effort for me to recall the exact wording of the graffiti on the restroom wall. I didn’t look like I belonged. I wore a tie every day, but no one seemed to mind. Maybe I was suitably alternative in my own way. Kate’s changed somewhat over the years but its core and more importantly its food never did. It expanded to accommodate its growing customer base. My friends Lisa, Mara, and I would meet for brunch at Kate’s. The fresh-squeezed juice, tofu scramble, sweet potato hash, and the vegan french toast were unequaled. The bottomless cups of coffee that Lisa considered the best in the city would extend brunch until late afternoon. If it was winter, we’d leave along with daylight. For several years running, I had Thanksgiving dinner at Kate’s, feasting on unturkey with stuffing, greens, mashed potatoes and yams. Then I started eating meat again. It was a post-9/11 decision. I left my office for lunch, wandered into South’s in Tribeca and ordered a hamburger. The world seemed harsher then. What had cows ever done for me? And I wasn’t going to Kate’s as much anyway. My beloved McKate with the tastiest fries west of the East River. You make a restaurant so much a part of your life, this is bound to happen: A woman I met a few months prior to 9/11 lived on Fifth Street and Second Avenue — strolling distance from Kate’s even in her high-heeled boots. She was not a vegetarian but enjoyed the atmosphere, the french fries, and the Karin’s Burger (sauteed spinach, portobello mushrooms, “fakin bacon” and cheese), which she always paired with a Guinness. She never strayed from the Karin’s Burger, but I would usually scan the specials for the occasional reappearance of the McKate, which was two-unbeef patties, special sauce, lettuce, cheese on a whole wheat sesame seed bun. I like to credit myself with persuading them to make it a permanent addition to the menu. I kept the Guinness. It had been a tough week. Flea Market, a French bistro on Avenue A, began to replace Kate’s as my neighborhood hangout. True, my ex and I took advantage of the unlimited mussels and fries more than once, including on my 28th birthday that summer, but overall it offered more steak and less sentiment. It also seemed a more mature choice as I entered my 30s, a more sophisticated place to meet someone for a first date. I dropped in at Kate’s for a handful of brunches over the next few years. One of my last Sundays in New York, I felt the urge to stop in to read the paper over a plate of Buffalo Un-Chicken Wings, fresh-squeezed orange juice, and Ms. Halpern’s incomparable coffee. That might have been the last time. With nine days left to go, Kate’s has raised less than $2,000 of the $30,000 it needs to continue. It will be a great blow to the neighborhood if Kate’s closes. I guess our youth ends eventually but at Kate’s, I could at least still taste it.